For most South African students receiving an internship in Europe is something they could only dream about receiving, but for Tetlanyo Lekalake, Sizwe Ndlovu and Thembeka Setlogile from UCT, their dream is about to become a reality. The trio entered The International Business Game, a competition hosted by Pernod Ricard Internationally targeted at final year and post-grad students, where teams of three (3) had to create a digital marketing strategy for one of Pernod Ricard’s most dynamic brands, Absolut Vodka. Business Science students Tetlanyo Lekalake and Thembeka Setlogile and Computer Science major Sizwe Ndlovu of the Faculty of Science of UCT were chosen to represent South Africa at the International Final in Paris against the world’s top marketing students, and were selected joint winners with the students from Russia. 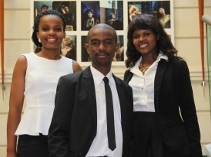 Tetlanyo, Sizwe and Thembeka will start their international internships in January 2014, after completing their honours degrees at UCT. “This is an opportunity we would like to offer many more South African graduates, and we will be rolling out another national campaign at the end of this year. Interested final year and post-grad students can keep an eye out for more information on the Spirit of Entrepreneurs website, www.spiritsofentrepreneurs.com,” concluded McQuaid.